Each group will enjoy age appropriate games, stories, discussions, prayers and songs. Rosh Hashana Kids Program is from 10:30am - 12:30pm. Yom Kippur Kids Program is from 10:00am - 12:00pm. 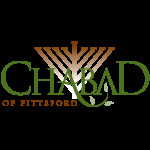 All Services will take place at the Chabad Center of Pittsford, 21 Lincoln Ave, Pittsford Village. High Holiday Services are open to all and there is no charge for attending our services (donations welcome)!